Please tell us a little about yourself Vassilis. I was born in a small Greek town –Karpenisi- surrounded by mountains and was really lucky to be a “village” boy. I had the opportunity to see sceneries that influenced my viewpoint and perspective and maybe unconsciously defined the absolute meanings of words like “sunset”, “snow”, and many others; all important ingredients of a landscape photographer. I left Karpenisi at the age of 11 and spent some 20 years in different towns and the last 10 years I live in Patras, a beautiful town near the sea. I am not a professional photographer although my job has a lot of similarities. I am a physicist and have a position in the Aristotle University of Thessaloniki as a Lecturer. One of my scientific interests is Atomic Force Microscopy (AFM) which simply means I take photos of molecules and how they self-organize on thin-films. Being a physicist helped me a lot to go deeper in photography and long-exposure photography was the absolute tool to work and experiment. Canon EOS 7D • Focal Length17 mm • 150 sec. • f/14 • ISO 100 Thessaloniki. I found this port just 15 minutes walk from the central port of Thessaloniki. Spent many hours during the morning and also went there for the sunset (see next photo). The galleries on your website(s) are filled with stunning landscapes. How and why did you became interested in photography in general, and landscape photography specifically? Physicists have a term for this. When there is no physical meaning for the beginning of a physical phenomenon they define the time=zero as an anomaly point. The same for me. One day I just felt I had to buy a dslr camera and started to shoot. Well maybe everything was prepared subconsciously and my profession, my childhood, the need for a way to express my inner world played their roles as catalysts to this mind function. After three months I knew I did not want street photography (maybe not too smart to catch the right moments, felt uncomfortable to shoot people) and it took me two more months to see that I will be a devoted landscape photographer. At the bottom line I wanted to be alone with the nature. I tried to take realistic photos but never felt satisfied. At that moment neutral density filters came to my life and a new surrealistic world –the world I always see in my dreams- could be captured by my camera. This discovery changed everything in my life and from that moment I give all my creativity to elaborate my surrealistic view. The last year I started to work with infrared photography, another powerful way to capture surrealistic ‘scapes. Please tell us about the techniques you use to create your beautiful landscape imagery. As I said before, I have only one technique and that is long exposure. So all my lenses have neutral density filters and never consider separated them. I use all types of neutral density filters but usually the very dark (10 f-stops). So I always carry my tripod and my exposure times are from 30 secs to 15 mins!! 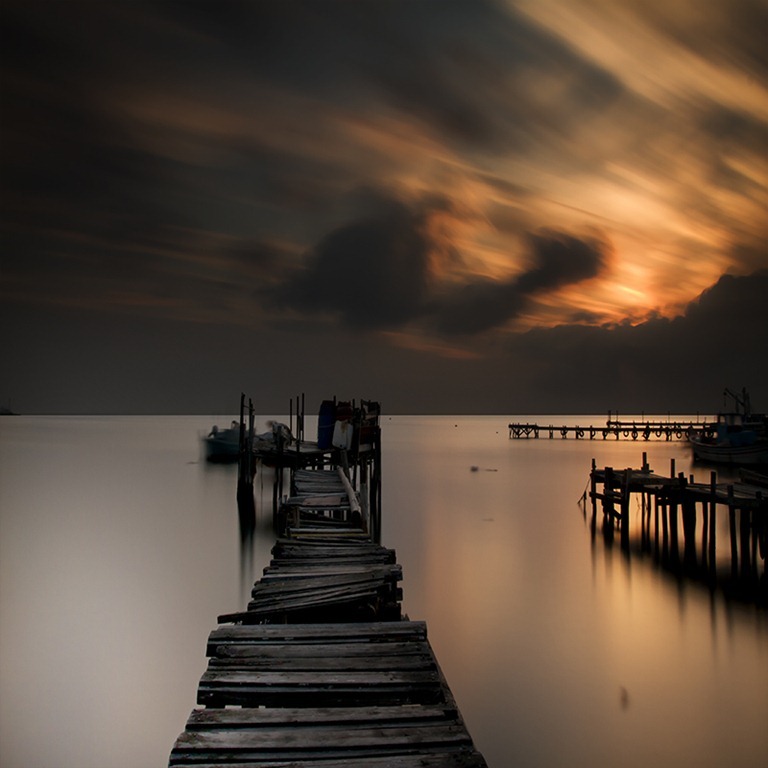 Imagine a sky with clouds that move quickly close to sunset and an exposure time of 2 minutes. The gradients of light and the blurriness of clouds all in just one picture. Such a dynamic phenomenon can be captured so great with long exposure photography. I also use cyclic polarizers as well as red, blue, green filters. You can understand that I spent some time to prepare my camera – more like an experiment – prepare my filters, define my scenery, predict the differences of light. I also use ND graduated filters to adjust the exposure dynamic ranges of colors. Finally my mp3 player since I need a music background when I try to create my photograph. For the case of infrared photography I use the standard IR filter (590 nm) as well as a more color one (620 nm). Canon EOS 7D • Focal Length17 mm • 95 sec. • f/16 • ISO/Film100 Patra-Greece. The bridge study. More than 1000 photos on this subject and still think I have to take more. I shoot as a hobby but for me photography is a way of living so yes I want more and I guess I have to wait. What equipment do you use? Is there other equipment you wish you had that would improve your ability to make great photos? I use right now a fantastic camera body, Canon EOS 7D, and my main lens is the Canon 17-40mm, USM. Maybe, someday, I will buy a full frame but right now I am totally satisfied. For my kind of photography I do not need any other equipment… just imagination, good light and good sceneries. Canon EOS 7D • Focal Length17 mm • 88 sec. • f/16 • ISO/Film100 Lake Tourlida-Messologi-Greece. A perfect place for meditation and studying reflections. Fishermen’s houses. I use Photoshop CS5 for windows, (both 64bit and 32bit). It is more than enough. Canon EOS 7D • Focal Length17 mm • 70 sec. • f/11 • ISO/Film100 Lake Tourlida-Messologi-Greece. All these photos are from processing of different exposure times and manual blending. This is the power of PS and that why I do recommend a good knowledge of this software. Some people have made the point that the art of making images is evolving to require less camera-based skills and more post-production skills. What are your thoughts on that? This is a quite important question and to say the truth I had to answer it many-many times. For me the camera is a cold apparatus designed to capture moments (seconds, microseconds, or many minutes in my case). There is a decisive moment where you have to make a connection between the photographer and the captured photo. And this connection happens when you take the photo and add all your emotions through processing. If this connection, this magical chemical equation, never happens, then you just have a “cold” photograph with no signature from the artist. I really like when someone says to me “I saw the thumbnail of a photo and I understood that this was made by you.” This means that my equation gave the ideal product and somehow this picture reflects my inner world. 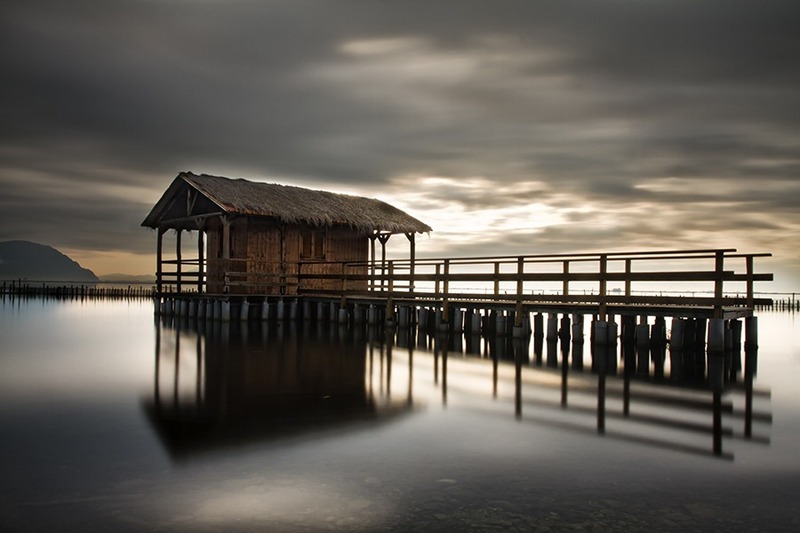 Especially in long exposure photography processing plays a vital role since you deal with surrealistic tones. But you need also a very good balanced photo which means well executed and of course your camera-based skills need to be well trained. What is the most challenging part of your photography and where do you find your inspiration? The most challenging part is to make minimal photography… capture a simple artifact and make a photo full of emotions. In the beginning I wanted busy photographs but right now I think “the less the better”. 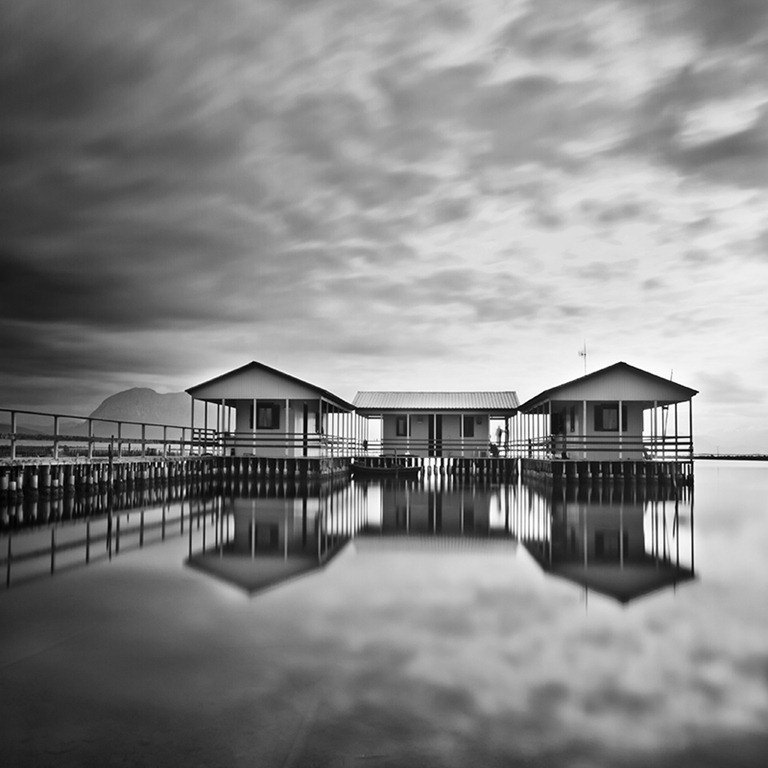 My inspiration is two fold: it mainly comes from some very talented photographers –Michael Levin, Joel Tjintjelaar to mention a few, real ‘gurus’ of long exposure photography and from the warm comments of true fans of my photography. Especially Joel was kind enough to comment on my work and give me good advice. Canon EOS 7D • Focal Length17 mm • 120 sec. • f/16 • ISO/Film100 From my second trip to Messologi and Lake Tourlida. Love these colors, makes the whole scenery so surrealistic. It was a very stormy day and I had to put around five kilos of weight to adjust the stability of my tripod. In that trip my zoom lens is damaged (dropped by the wind to a rock). What role does social media play in your photographic endeavors? Huge role indeed. Right now I am on Facebook, Flickr, RedBubble, DeviantArt, Behance Network, 500px, Twitter, Stumbleupon. I find all these networks as tickets to make my work known, not to mention that I also sell my pictures through them. My ultimate goal is to make my photo-site and sell the pictures but this will happen later on. Canon EOS 7D • Focal Length17 mm • 78 sec. • f/16 • ISO/Film100 Back to Patra and another favorite subject of mine. The lighthouse. Close to sunset , two exposure times and manual blending. My tonal contrast gives a plastic form to the rocks making an interesting foreground. I always learn from long exposure photography. ‘My motto is every ‘scape can be a dreamscape. No need to go to exotic places, you can make someone say “Woe! !” by capturing a scape just outside your house. Just find the right light, the right frame, do the right processing and put the dream stuff on it. Right now I plan several trips to some interesting places in Greece. My goal, (at least for the next couple years), is to show Greece through long exposures and believe me, there are some really wonderful places in my country; plan some exhibitions (one in Greece, Athens and one in Germany in November, Ludwigsburg, gallery Diepotheke) and right now, prepare my Blurb book with works covering the period 2010-2011. 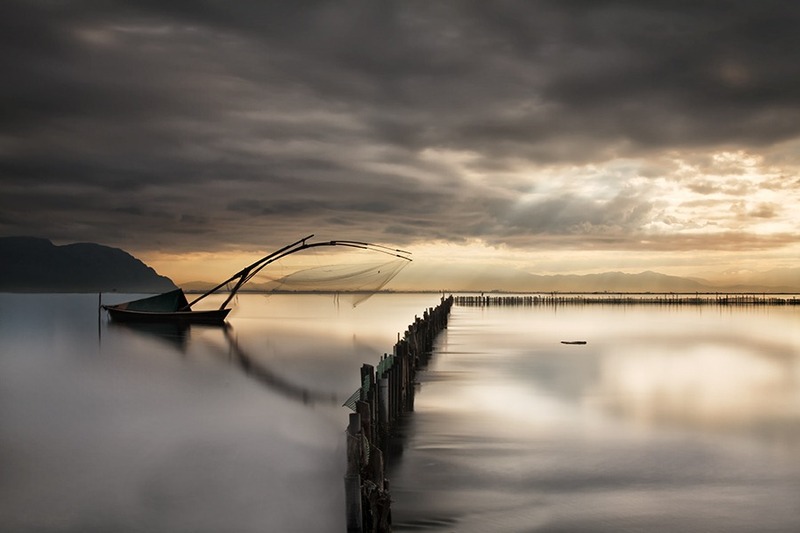 Canon EOS 7D • Focal Length17 mm • 80 sec. 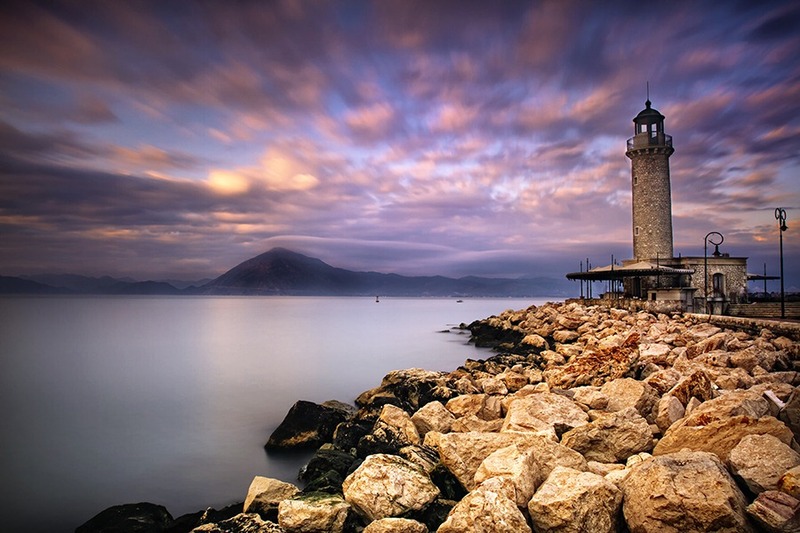 • f/16 • ISO/Film100 A lighthouse in Egio (20 Km outside Patra). That day was almost cloudless but there was a very warm light. Long exposure helped revealing some cloud movement, and using PS I emphasized a little bit the orange light. What recommendations would you make for someone hoping to improve their landscape photography? I have a good knowledge of Photoshop-worked for two years also in the creative department of a software company – making the designs of web-sites and commercial brochures. Found this experience vital when I started to process photos. Just a small comment here: I do not like the over processing of a picture and this is so common in our days especially with HDR processing. I read a lot of books about photography and especially long exposure, and spent many hours studying the portfolios of the people I admire. With this way, I exercised my eyes and also became inspired. I never took any classes to say the truth but maybe for someone that starts now it is a good starting point. My advice is spend hours experimenting and try to find your style. Canon EOS 7D • Focal Length17 mm • 160 sec. • f/16 • ISO/Film100 Last but not least from the old port in Thessaloniki again. 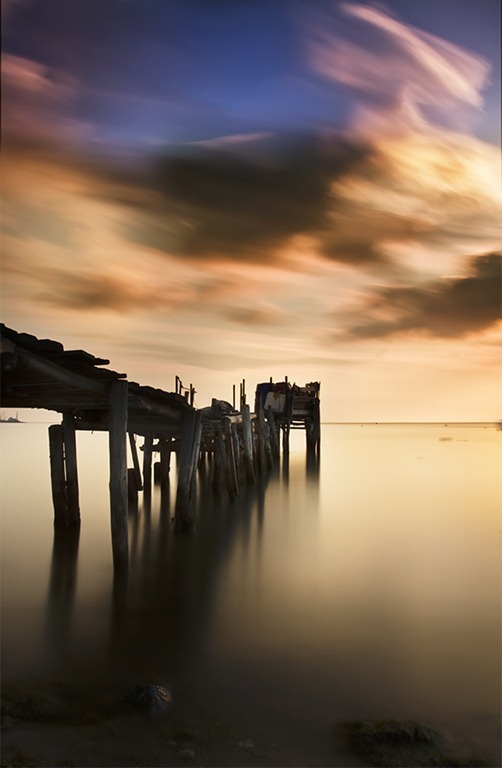 Check how blurred the sky is while the diffused colors make a surrealistic sunset. Like the dark figures and in many of my photos I prefer dark shadows. Please add any other information, thoughts, and advice you’d like to share. Well I never consider myself as a complete photographer. I still learn a lot and do many mistakes. What I really need is good comments that help me improve my skills and to say the truth I ask always the opinion from people I admire. I try to help anyone who asks me for advice since photography unites people, cultures and improves me as a person. I always say that through photography I become a better person, understand better how fragile we are against nature, and how thankful we must be for all her gifts. I only hope my dreamscapes can touch the soul and mind. So welcome to my world. Thank you for sharing your craft and your techniques with us Vassilis. Your photos are works of art and your techniques are inspiring. I suspect you will be responsible for the purchase of a number of ND filters by many of our 2 Guys Photo readers! 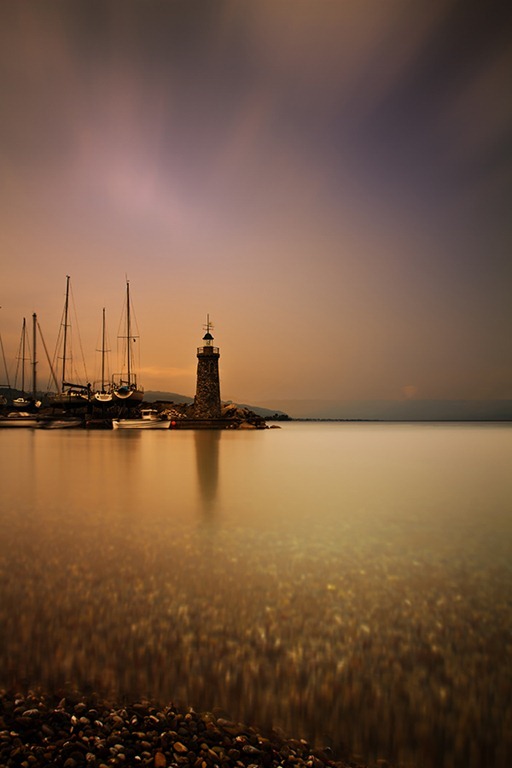 Vassilis’ photography can be seen at his flickr photostream and at his 500px website. Please visit and discover more of Vassilis’ landscape creations. 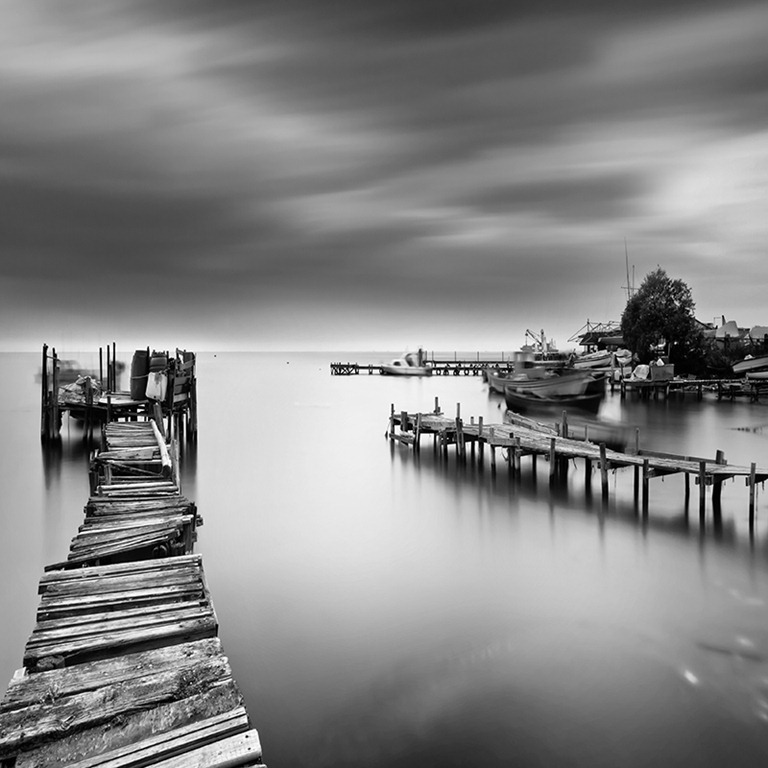 This entry was posted in Featured Photog, Images, Inspiration, Travel and tagged Featured Photographer, Greece, landscape, neutral density, photogrpahy, Vassilis Tangoulis. Bookmark the permalink. Amazing images! Thank you for sharing them here! 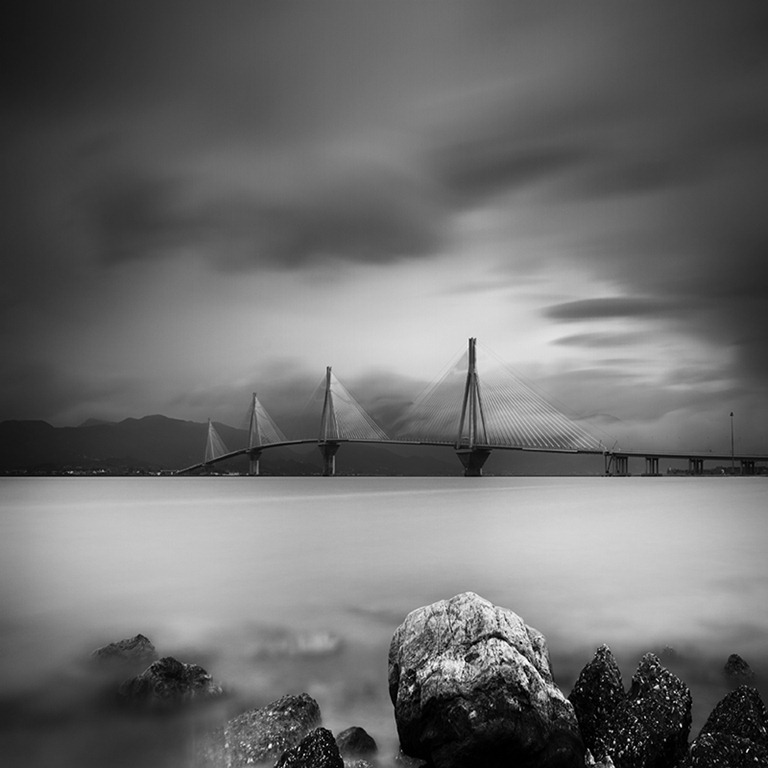 Thanks for the introduction to Vassilis’ photography. I really enjoyed the read and his images. I would to thank Ed and Rey for their kind invitation. You are doing a great job inspiring people and making them truly love photography..Keep up your great work! WOW!! What amazing photography! 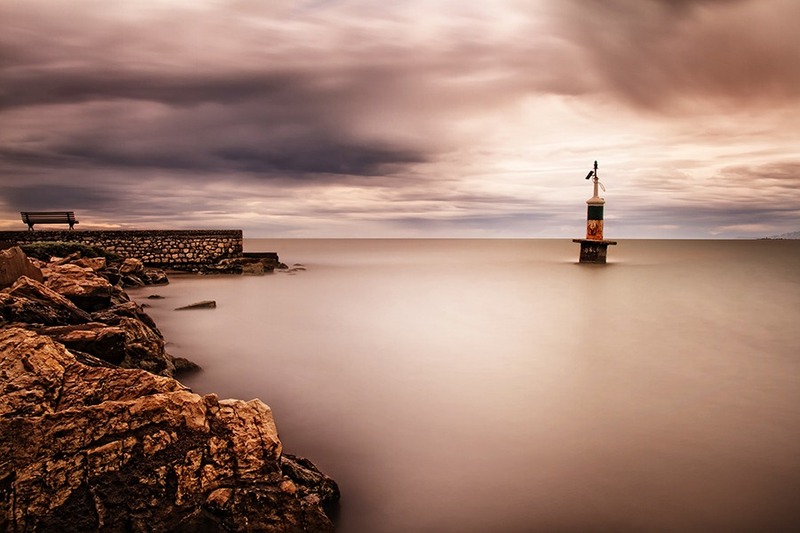 This post makes me want to do two things… First, Get a tripod and shoot long exposures! Second, Go to Greece! Thanks for the photos Vassilis, AND thanks for sharing Two Guys. These are truly stunning images. I’m inspired to try the long exposure, 10 stop ND filter, technique… and would feel VERY fortunate to capture something half as interesting as these photos. 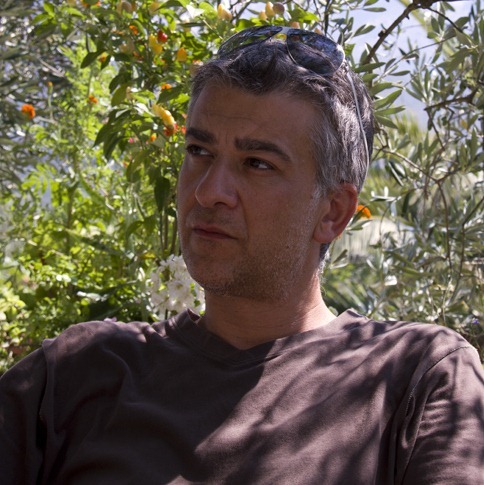 Nice work, Vassilis! Many thanks Rey! My favorite band is “Waterboys” ..feel like they are so close to the water element of my pics..(favorite song..The Whole of the moon..!). I can here the same song like for ever…. WOW very inspirational photography! Thanks for showing us about the technique. Very inspirational. “Long exposure” as an specific area of photography is one that I didn’t even know existed. That your ND filters never come off of your lenses is quite unique. The results are stunning. An impressive collection of photographs. In each one, the smoothness is striking and effective.